R55109 Regimental Sergeant Major Walter Hugh Victor Mackintosh, MM was born in Dorset, England, a veteran of World War I and the Regimental Sergeant Major of the QOR 1922- 1925. At the time of his enrollment into the 19th Battalion CEF on 9 November 1914 he was single and listed labourer as his occupation. By the time the 19th Battalion sailed for England on 15 May 1915 he was promoted to Sergeant. He landed in France 15 September 1915. In April 1916 he received shrapnel and gun shot wounds to his head and right shoulder and returned to his battalion by July. In September 1916 he was wounded again this time with 5 shrapnel and gunshot wounds. He did not return to the 19th Bn and was invalided to Canada in May 1918. 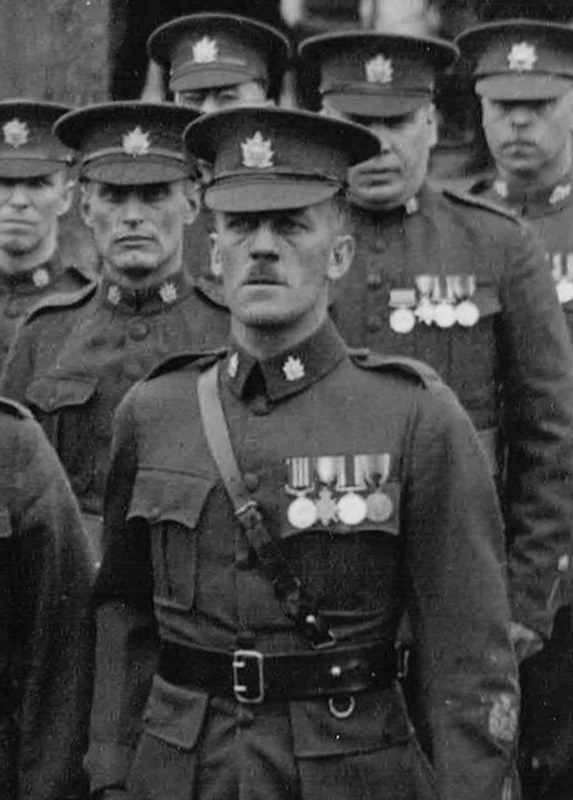 In January 1917 he was awarded the Military Medal for bravery in the field while serving with the 19th Bn. Although discharged as unfit due to his wounds, Mackintosh managed to rejoin the Queen’s Own where he was appointed RSM from 1922 to 1925. 1922, 7 May, is pictured as RSM during the annual Church parade.